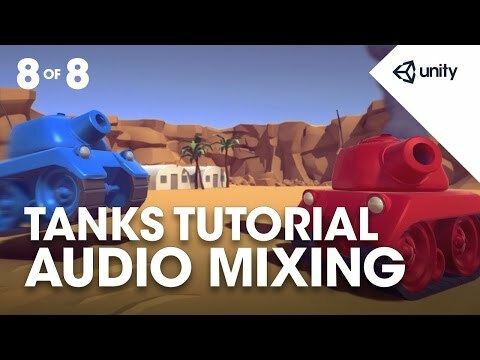 Phase 8 teaches you how to balance the audio implemented in the game, creating a dynamic mix where our sound effects duck the volume of our music. for our game, so we need an audio source. hit return and you'll have yourself an audio component. and choose BackgroundMusic as the clip. check Loop at the bottom. I'm just going to keep saving my scene to update it. We're going to create what's called and audio mixer. game objects in the scene, they might be on instantiated objects. in order to balance them with one another. Click the Create button and choose Audio Mixer. So this is a Create button on the project window. I'm just going to rename this MainMix. So it's control8 on pc, command8 on mac. dock it by the scene view, it's totally up to you. you use, but Unity calls them groups. it's own group. Makes sense? with + buttons, so Groups is one of those. I can make a new group. each of those groups to be a child of that. so I just call it SFX. more for our driving audio. So the idling and the engine sounds. so that they're children of that. correct group that we've just made. but first we need to hook everything up. Prefabs folder and I select Tank. is to look at the audio sources there. which group this is going in to. and we're going to select Driving. should be routed to Driving, the second to SFX. And that's our Tank setup. ShellExplosion which has the audio source attached to it. to the SFX mixer group. So what else needs routing? so we need to set that up as well. and set that to Music. the audio source there needs setting to sound effects. really quickly, please don't do this, I'm just going to demonstrate. the SFX gets a level too. of the music down a little bit. It's kind of loud, it's compressed as you'd expect. I'm going to bring that down to -12, so do that now. Drag that fader down to -12.
and set that way down to -25.
so that it's nice and subtle in the mix. level to dip every time a sound effect comes in. So we do that with something called ducking. I'm going to click on Add. So here I can add a Duck Volume effect. them and they highlight in blue. a warning saying 'No Send source is connected. tell it to duck, so we need to sort that out. So what I'm going to do is go to my SFX group. I'm going to add a send. And that send has a receive. and then how much of this do we want to send? we're going to drag it all the way to the top. What does Duck Volume mean? using one signal to subtract from another. is going to be required to decrease that. Okay, so I'm going to reselect my Music. And I'm going to look at that Duck Volume. show you how that works. so you can hear what I'm doing. and my Attack Time to 0.
to wait, we want it to start straight away. So Attack Time should be 0. Ratio should be 250. So now. and obviously you can check it out with headphones as well. But that's exactly what's happening. because we have completed our training day.